Most children with cancer in Canada now survive. But they're at greater risk of poor mental health outcomes, such as anxiety and substance abuse, according to a Canadian oncologist who was surprised at the extent of severe issues. The findings have implications for mental health supports and parenting those who have survived cancer. Among cancer survivors who were four years and younger when they were diagnosed, 131 had a severe event during the follow-up period of the study. "And then when your kids survives, then we ask parents to do maybe an equally hard task, which is to turn that hyper vigilance off. " Gupta, a clinician investigator at Sick Kids who treats children with leukemia and lymphoma, gave an example: "I had a mother once tell me that coming off of treatment was in a very strange way just as hard as going on to treatment." 'Like a room with the lights out' The findings make sense to Geoff Eaton of St. John's. "But we have focused so heavily on treatment that we almost entirely neglected the rest of the patient's life," he said. Gupta wants cancer survivors, their families and health-care providers to be aware of the mental health risk, just as they are attuned to long-term physical health effects of surviving cancer, such as cardiac health. The subjects in the study were diagnosed before age 18 and treated between 1987 and 2008. Most children with cancer in Canada now survive. But they’re at greater risk of poor mental health outcomes, such as anxiety and substance abuse, according to a Canadian oncologist who was surprised at the extent of severe issues. About 80 per cent of children with cancer will achieve a long-term cure. Yet childhood cancer survivors may be vulnerable to long-term physical effects that can be severe. Less is known about impacts on mental health. 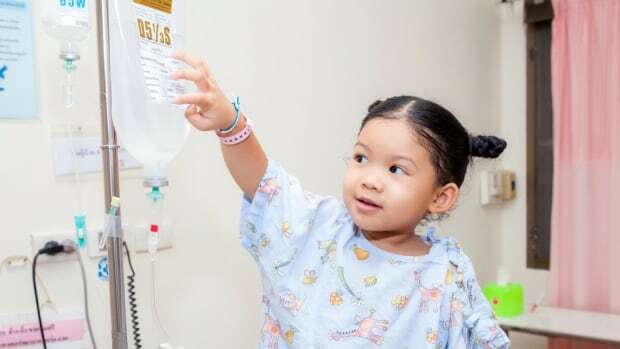 In Thursday’s issue of the journal Cancer, researchers analyzed data from about 4,000 childhood cancer survivors in Ontario as well as 20,000 others in the general population to compare health care use. The findings have implications for mental health supports and parenting those who have survived cancer. Among cancer survivors who were four years and younger when they were diagnosed, 131 had a severe event during the follow-up period of the study. By age 28, the cumulative incidence of a severe event such as hospitalization or visit to an emergency department for a mental health reason among this group was more than 16 per cent. “That really surprised us,” said Dr. Sumit Gupta, a co-author of the study and a staff oncologist Toronto’s Hospital for Sick Children. The most frequent mental health issues included anxiety, substance abuse and mood disorders. The researchers also found that childhood cancer survivors had a 34 per cent higher rate of medical visits for a mental health complaint compared to the general population.